C.G. 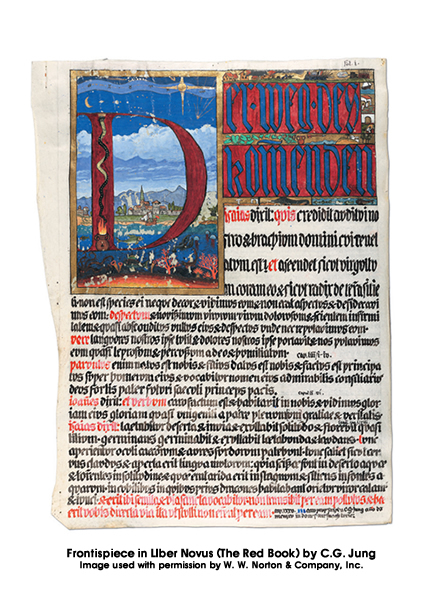 Jung opens his Liber Novus (The Red Book) with several elements: an elaborately painted initial, “Der Weg des Kommenden” (The Way That is to Come), three calligraphic script passages in Latin from the biblical book of Isaiah, and one from the Gospel According to John. This material fills the entire first page and closes in Latin with, “Written by C.G. Jung with his own hand in his house in Kusnach/Zurich in the year 1915” (Jung, 2009, folio p. 1). Shamdasani (2012) places Jung’s Red Book in the tradition of William Blake’s illuminated printing. Jung combined poetic word and artistic imagery in the creation of the Liber Novus. Like the frontispiece of Blake’s The Marriage of Heaven and Hell, we may appropriately characterize this first folio page as the frontispiece for Liber Primus and the whole Liber Novus. This paper, however, will more modestly focus on the four biblical texts and their utilization at three levels: First, seven passages from Isaiah including the three in the frontispiece are found in the context of Chapter 5 of Psychological Types (Jung 1921/1923/1971) simply as examples of resolving symbols deriving from the least expected sources; second, the four prophetic passages in the frontispiece will be further amplified by their original context using common biblical criticism; third, the particular order of their presentation prompts a thesis as to their relevance for Jung’s very human and personal dilemma at midlife. These Latin biblical texts are from the Vulgate translated by St. Jerome from Old Latin, Hebrew, and Greek versions circa 380 CE. The Vulgate represented the “vulgar” or common language of the time when Greek and certainly Hebrew were no longer widely known. The Vulgate became the standard bible of the Western Church. Jung grew up steeped in biblical culture and imagery. His maternal grandfather and his father were Hebrew scholars. One might assume he chose the Latin rather than Hebrew, Greek, or German texts he knew well in order to be consistent with the manuscript language, script, and style tradition he was emulating. Writing in this manner placed him in the Western intellectual and religious tradition he was representing in his dialogues with the inner figures who visited him during his encounter with the unconscious. Shamdasani (2012) wrote, “The calligraphic manuscript of Liber Novus enacts a return to a pre-Reformation period. Jung was attempting to recover something lost in Western culture since before printing — before the split of science and religion, prior to the rise of modern rationality and the triumph of the ‘spirit of the times’” (p. 130). Isaiah said: The wilderness and the solitary place shall be glad for them; and the desert shall rejoice, and blossom as the rose. It shall blossom abundantly, and rejoice even with joy and singing….Then the eyes of the blind shall be opened, and the ears of the deaf shall be unstopped. Then shall the lame man leap as a hart, and the tongue of the dumb sing: for in the wilderness shall waters break out, and streams in the desert. And the parched ground shall become a pool, and the thirsty land springs of water: in the habitation of dragons, where each lay, shall be grass with reeds and rushes. Of these four passages Shamdasani (2012) noted simply, “Thus it was presented as a prophetic work, and outlined the symbolic significance of what was happening in the world and its implications” (p. 117). The note of simultaneity is emphasized to suggest the broader conceptual and imaginal field in which Jung was living and working at the time. Even as he entered into dialogue with his unconscious, he maintained his clinical practice, studies, family life, and military responsibilities by day (Shamdasani, 2009). Jung’s massive literary and philosophical research into typology stands alone as one of his major contributions to the understanding of human differences. More importantly perhaps it led him to a seminal appreciation for and description of the dynamic process by which symbols emerge from the unconscious to reconcile conflicts between types and other dilemmas in the conscious rational realm. Shamdasani (2012) wrote concisely, “The issue was not the depiction of types, but how the conflict of opposites could be resolved through the emergence of the reconciling symbol—one of the central themes of Liber Novus” (pp. 137-8). Jung (1921/1971) explained, “It is this process in the collective psyche that is felt or intuited by poets and artists whose main source of creativity is their perception of unconscious contents, and whose intellectual horizon is wide enough to discern the crucial problems of the age” (Para. 433). Beyond the popular notion of prophets as prognosticators, Jung’s quote beautifully describes the contribution of prophets like Isaiah who discerned the signs of their times and were able to tap the unconscious and envision images of a divine future beyond those of the given tradition. [T]he solution comes from the side it was least expected…. [It] is associated with an irrational impossible condition: the pregnancy of a virgin (Para. 438). ‘Behold a virgin shall conceive and bear a son, who shall be called Immanuel’ (Is 7:14 KJV). [T]he redeeming symbol occurs just when one is least expecting it, and in the most improbable of places…[and] in a form that has nothing to recommend it. (paras. 439-40) ‘He is despised and rejected of men’ (Is 53:1-3 KJV). The immediate effect of the redeeming symbol is the union of opposites (para. 458). ‘The wolf also shall dwell with the lamb’ (Is 11:6-8 KJV). The nature of the redeeming symbol is that of a child — childlikeness or lack of prior assumptions is of the very nature of the symbol and its function” (para. 442). ‘For unto us a child is born’ (Is 9:6 KJV). The tension that precedes solution is likened in Isaiah to pregnancy (para. 443). ‘We have been with child, we have been in pain, we have…not wrought any deliverance’ (Is 26:18 KJV). With the birth of the symbol, the regression of libido in the unconscious ceases (paras. 444-5). ‘In that day the Lord …shall slay the dragon that is in the sea’ (Is 27:1 KJV). The blossoming of new life and fruitfulness where all was arid before is described in Isaiah 35:5ff: ‘Then the eyes of the blind shall be opened [and] in the wilderness shall waters break out…And an highway shall be there and a way’. The redeeming symbol is a highway [Bahn], a way [Weg] upon which life can move forward (para. 445). Images from Isaiah were much on his mind as Jung worked simultaneously on typology and symbol development during the time of his encounter with the unconscious. The fact that these same images appear in both the frontispiece to the Red Book and the text of Psychological Types suggests mutual influence. The prophetic texts from Isaiah and John which Jung included in the frontispiece are amplified through common biblical criticism. In Symbols of Transformation (1912/1956) Jung references German Old Testament scholar, Herman Gunkel (1862-1932) (para. 379). He is the originator of biblical “form criticism” which assumes long years of oral tradition prior to writing and seeks to identify the literary genre of a text in discerning the Sitz im Leben (life setting) from which a text originated. Jung was presumably familiar with such biblical scholarship; but he was not taken with the value of biblical criticism for the good of readers’ souls (Rollins, 1983). Yet some critical amplification of these texts is our project here. Nineteenth-century biblical scholarship had long made clear that the “book” of Isaiah is more accurately described as at least three collections of prophetic material from three widely separate eras of Israel’s community experience all ascribed to the prophet Isaiah. Shamdasani (2009) outlined the complicated process by which the Black Books, drafts, layers, typed versions, and edits became in the end the version Jung transcribed into the Red Book. Similarly the authorship process of the book of Isaiah was primarily an oral tradition across many generations which culminated in the collection and codification in written form of various oral and written versions. The historical Isaiah preached and taught in the court of Judah in Jerusalem over a fifty-year span from 742-687 BCE. In general, chapters 1-33 of the biblical book that bears his name reflect this time period and are more accurately attributed to him and his direct disciples. It was a time of tremendous political challenge as the Assyrian Empire was on the rise and the little kingdoms along the East coast of the Mediterranean including the Kingdom of Judah were threatened with envelopment. It was a time of strident prophetic call to faith in the Lord over against this political and religious threat (Jensen & Irwin, 1990). Isaiah challenged Judah’s King Ahaz (735-715 BCE) to have faith and ask for a sign. Ahaz would not presume to test the Lord for a sign; so Isaiah counters, “Assuredly, my Lord will give you a sign of his own accord! Look, the young woman is with child and about to give birth to a son. Let her name him Immanuel” (Is 7:14 Jewish Publication Society). Isaiah expected that a contemporary king, perhaps Ahaz’ yet unborn son, Hezekiah, would be faithful to the covenant and allow the Lord to save the dire situation. This was not the case, and disappointment in yet another king moved Isaiah to envision a new hope and expectation for a future ideal king in the mode of founding King David—a Messiah or Anointed One. A second collection of prophetic material attributed to Isaiah comes from a prophet or prophetic school during the time of Judah’s exile in Babylon (587-539 BCE). They and chapters 34-55 are usually referred to as Second Isaiah. Assyria had succumbed to Babylon whose expanding empire engulfed Judah and took Judah’s leading class and tradespeople into exile in 587 BCE. Away from their beloved temple and the religious practice surrounding it, there was urgency about collecting, editing, and writing the traditions, particularly the Torah, to preserve them. The “book” of Isaiah was likely collected and written on scrolls during this time. In exile they became “people of the book” (Stuhlmueller, 1990). Yet as generations passed the exiled people of Judah were losing faith in the Lord and the possibility of return to Jerusalem, the temple, and a righteous Davidic king. In that dilemma two sources of saving hope were nurtured by the prophets of the exile and both were tapped by Jung in the frontispiece. One was a renewal of the Jerusalem homeland vision. The wilderness highway passage from Isaiah chapter 35 selected by Jung for the frontispiece would not take the remnant people back to Jerusalem via the usual trade routes; but straight through the impassable Syrian Desert between Babylon and Jerusalem as the crow flies. In the tension between traditional faith in the Lord and generations of political and religious exile this vision of a new and resolving way was characteristically unlikely. When the Persian King Cyrus overcame Babylon and executed a policy of repatriating exiles in 539 BCE, a remnant of Judah was able to return to their devastated homeland via the normal trade route (Stuhlmueller, 1990). But the image of the mystical sacred highway endured and endures still. The second and equally unlikely new source of hope envisioned in the Isaiah tradition during the exile was that of the “Suffering Servant,” an individual or corporate figure, who would take on and expiate the suffering of the people. In the frontispiece Jung quotes four verses from the fourth of the so called “Servant Songs” in Second Isaiah which describe that “despised” figure and its role. Handel’s version rings in our ears. The canonical Gospels as we know them were also the result of 30 to 70 years of first-century oral and written development in diverse geographical, cultural and theologically fledgling Christian communities. The fourth and latest gospel is probably rooted in the experience and teaching of one of Jesus’ disciples named John. Sometime in the 80s of the first century a brilliant theologian, the “evangelist,” gathered the various Johannine traditions into a “gospel” beginning with the ministry of the Baptizer, “a voice in the desert crying out, ‘Make the Lord’s road straight’” (Brown, 1966 loc. sit. Jn 1:23 echoing Is 40:3). Finally in the 90s or later, a final redactor added a prologue interspersed with the Baptizer narrative. Echoing Genesis chapter 1 the prologue begins with a new image of the divine Word, “In the beginning was the Word, and the Word was with God, and the Word was God” (Jn 1:1 KJV). In the frontispiece Jung (2009) quotes a later verse from that prologue, “And the Word was made flesh, and dwelt among us (and we beheld his glory, the glory as of the only begotten of the Father), full of grace and truth” (Jn 1:14 KJV). In the face of expulsion from some synagogues and under sometime Roman persecution this was a new vision beyond all expectation (Brown, 1966). In their various political and faith crisis times, these prophets’ connection with the unconscious enabled them to envision divine activity in new and unexpected ways, perhaps beyond their own understanding, for the good of the community. Jung would have the reader take these “words of the poet [prophet] not literally but symbolically” (1921/1971, para. 129). This paper’s thesis is that Jung’s Sitz im Leben influenced the choice and order of the Biblical passages he quoted in the frontispiece. First is Isaiah 53, the pathetic leper-like figure of the Suffering Servant. Having broken with Freud, resigned from the presidency of the International Psychoanalytic Association, the editorship of the Jahrbuch and his lecturer status at the University, Jung experienced an “extreme loneliness. “[M]y friendship with Freud came to an end. From then on, I had to make my way alone” (Jung, 1961 p. 206). “I often felt utterly forlorn, I knew what I had to say would be unwelcome” (1961 p. 222). Bair (2003) narrated, “Jung was well aware of how ruthlessly Fliess, Adler, and now Stekel had been cast out and shunned….Thus in the letters the two men exchanged [in 1912] there was only bitterness, allegation, recrimination and retaliation” (p. 227). “There were other ways to isolate Jung, to sidetrack, stymie, and ignore him and Freud moved swiftly to instigate them all [often through his spokesman, Ernest Jones]….Jung had to be cast into oblivion…ostracized…for his ‘deviate’ views” (pp. 240-241). Jung (1961) wrote, “The link between [Job and Christ] is the idea of suffering. Christ is the suffering servant of God, and so was Job” (p. 216). He may well have felt himself in the suffering servant tradition. The second quotation in order is from Isaiah 9. In addition to a royal birth celebration emphasized by Jung, some scholars argue that this verse was originally a poem or song related to the anointing or enthronement of kings. Each king in succession was acknowledged as the adopted son of the Lord and given titles reminiscent of the renowned figures from Israel’s past i.e., the wisdom of Solomon, the courage and kingship of David, the stature of the fatherly patriarchs (Jensen & Irwin, 1990). In each royal succession “These honorific titles reproduce the essential qualities of the redeeming symbol” (Jung, 1921/1971, para. 442). In sharp contrast to the suffering servant images, this passage proclaims the grand qualities which can be said of Jung himself. He had become the “WunderKind” welcomed by Bleuler as “Our Siegfried” and adopted by Freud as “son and heir.” Burdensome administrative responsibilities for the Congresses, the Jahrbuch and the International Association among other expectations were placed upon his shoulders (Bair, 2003). “In Freud’s mind, Jung’s primary role was ‘direct successor to himself’” (Bair, p. 208). He was anointed “Crown Prince” in Freud’s circle. Jung was indeed considered a “Wonder-Counselor.” Bair (2003) wrote, [He was] “Internationally known and respected as a leading figure in experimental psychiatry. The word association test brought him initial renown, but his early book, The Psychology of Dementia Praecox, brought scholars and scientists to the Burgholzli because they specifically wanted to observe him at work” (p.209). The father archetype much engaged Jung at this time. The birth of his son, Franz Karl, moved him greatly. (Bair p. 151) He was distressed at the public scandal created with Sabina Spielrein’s accusation that he refused to father a “Seigfried” son-hero with her (Bair 2003). At their last meeting Freud and Jung had a personal conversation about the father complex. Later that day Freud fainted and Jung picked him up and laid him on a sofa. Jung recalled that Freud looked at him “as if I were his father” (Bair p. 236). I wrote these fantasies down first in the Black Book; later I transferred them to the Red Book, which I also embellished with drawings. It contains most of my mandala drawings. In the Red Book I tried an esthetic elaboration of my fantasies, but never finished it. I became aware that I had not yet found the right language that I still had to translate it into something else. Therefore I gave up this estheticizing tendency in good time in favor of a rigorous process of ‘understanding.’ I saw that so much fantasy needed firm ground underfoot, and that I must first return wholly to reality. For me, reality meant scientific comprehension. I had to draw concrete conclusions from the insights the unconscious had given me — and that task was to become a life work (Jung 1961, p.188). There were things in the images which concerned not only myself but many others also….my life belonged to the generality….All my works, all of my creative activity, has come from those initial fantasies and dreams….I took great care to try to understand every single image of my psychic inventory, and to classify them scientifically…to realize them in actual life (Jung, 1961, p.192). Gradually, through my scientific work, I was able to put my fantasies and the contents of the unconscious on a solid footing. Words and paper, however, did not seem real enough for me; something more was needed….I had to make a confession of faith in stone. That was the beginning of the ‘Tower’, the house which I built for myself at Bollingen (Jung, 1961, p. 223). The fourth passage is from Isaiah 35 and is directly related to the title image of Der Weg. Jung wrote (1921/1971), “The blossoming of new life and fruitfulness where all was arid before is described in Isaiah 35….The redeeming symbol is a highway, a way upon which life can move forward without torment and compulsion” (para. 445). Though not stated in the quoted passage, the biblical context is clear that the highway through the imagined desert wilderness led to Jerusalem. At least two spiritualistic allusions to Jerusalem in Jung’s Sitz im Leben suggest themselves. Jung’s maternal grandfather, Samuel Preiswerk, a professor of Hebrew and Old Testament Theology, “is regarded today as a Zionist precursor, for he believed that Palestine should be ceded to the Jews to become their homeland and a Jewish nation” (Bair, 2003). His granddaughter, Jung’s cousin, Helene (Helly) Preiswerk was the young medium whose séances Jung observed early on. In some of her trances she spoke in the deep, resonant voice of Samuel in High German rather than her native Schwizertutsch and sometimes even in Hebrew. In the first séance after the 1897 First Zionist Congress in Basel where Samuel was praised, 16-year-old Helly “described ‘Ivenes, her somnambulant self’, as a woman with Jewish features who spoke Hebrew (Savage, 2010). “Helly-Ivenes said that Samuel had charged her to complete his work of leading the Jews back to their homeland” (Bair, 2003, p. 51). The second allusion to Jerusalem relates to the appearances of the dead in Jung’s experience. Shamdasani (2009) wrote, “Amid the unprecedented carnage of the war, the theme of the return of the dead was widespread….The death toll also led to a revival of interest in spiritualism….The dead had appeared [to Jung] in a fantasy on January 17, 1914, and had said that they were about to go to Jerusalem to pray at the holiest graves” (p. 205). They wandered there because they “…still have no peace” (p. 294). Two years later the Jung household was bothered by and “thickly filled with ghosts” who told him, “We are returning from Jerusalem, where we didn’t find what we are looking for” (Bair, p. 204). The holy city of the three religions of the book did not satisfy the spiritual needs of the wandering dead who then compelled Jung to write the Seven Sermons. Brown, R. E. (1966). The Gospel According to John (i-xii): Introduction, Translation, and Notes. Garden City, NY: Doubleday. Jensen, J. & Irwin, W. (1990). Isaiah 1-39. In R. Brown (Ed. ), The New Jerome Biblical Commentary. Englewood Cliffs, NJ: Prentice Hall. —. (1961). Memories, Dreams and Reflections. Jaffe, A. (Ed.). New York: Vintage Books. —. (2009). The Red Book: Liber Novus. New York: Norton. Owens, L. (2011). Jung and Aion: Time, Vision, and a Wayfaring Man. Psychological Perspectives, 54(3), 253. Rollins, W. G. (1983). Jung and the Bible. Atlanta, GA: John Knox Press. Savage, J. A. (2010). Trust and Betrayal: Four Women under Jung’s Shadow. In S. Wirth, S. Meier & L. Hill (Eds. ), Trust and Betrayal: Dawning of Consciousness. Spring Journal, Jungian Odyssey Series, Vol. III. Shamdasani, S. (2009). Introduction. In The Red Book: Liber Novus by C. G. Jung. New York: Norton. Shamdasani, S. (2012). C. G. Jung: A Biography in Books. New York: Norton. Stuhlmueller, C. (1990). Deutero-Isaiah and Trito-Isaiah. . In R. Brown (Ed. ), The New Jerome Biblical Commentary (pp. 329-348). Englewood Cliffs, NJ: Prentice Hall. Gerald Kegler M.Ed., is a longtime member and sometime board member of the Minnesota Jung Association. For five years he participated in the related Seminar in Jungian Studies taught by local and visiting analysts and scholars. Seminary training introduced and schooled him for a lifelong interest in critical biblical studies. This combination of academic interests moved him to write “Frontispiece for Liber Novus: Biblical Texts on Folio Page One of the Red Book,” incorporating both disciplines.